A letter like this rarely comes around. 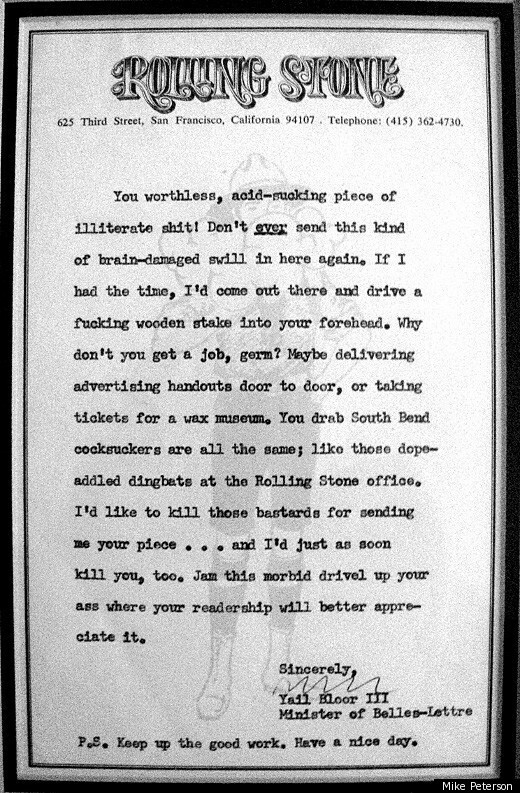 We can't actually prove that Hunter S. Thompson wrote this, but if you're familiar with his work there's a few tell-tale signs that the man himself was likely behind this absolutely amazing response to a piece submitted by a young Rolling Stone fan. In any case, this letter was actually mailed to Mike Peterson in response to a piece he submitted to the magazine in 1971. While it's signed "Yail Bloor III, Minister of Belles-Lettre," Thompson is often known for his use of fake names (famously Raoul Duke in Fear and Loathing In Las Vegas), and it seems more than plausible that this came from him. Peterson's piece (which you can read for yourself here) was obviously rejected, but the payout still seems to have been worth it. The author, just 21 at the time, walked away with this incredible piece, ended with just a bit of encouragement. Hat tip to Mike Peterson for permission to use the image. UPDATE: Peterson has been able to confirm that the letter was actually written by Thompson. In fact, the text of the letter actually appeared in a biography of the writer. How many people it was sent to remains unknown, but in all likelihood this version was meant for Peterson, as it references South Bend, where he was living at the time.